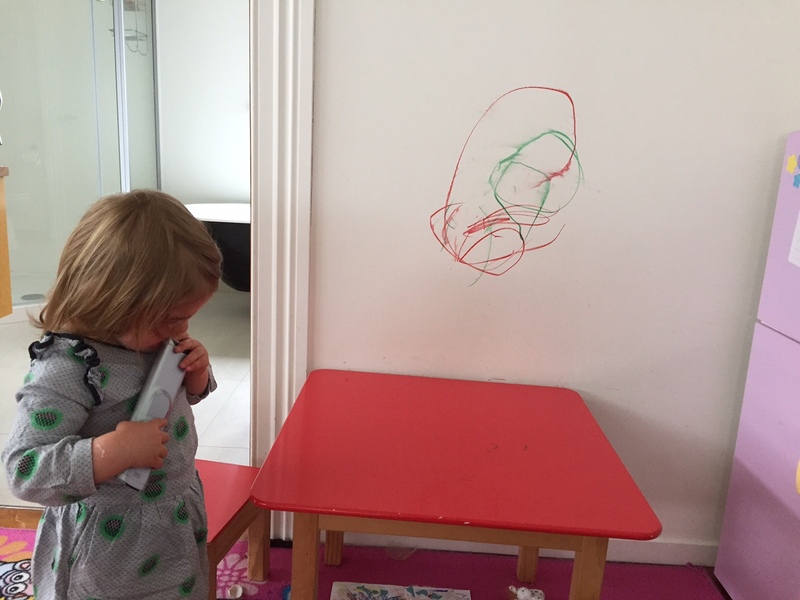 Heard a little voice saying “sowee, sowee, didn’t mean to!” and found Tilly pointing the remote control at the wall frantically pushing buttons, trying to erase all evidence of her wall art. I don’t know what pre-schematic means, but it sounds more “University Scholarship” than “Juvenile Detention”, so let’s go with that. Either way, I’m recovering from my wall-scrubbing efforts with a giant bowl of carbs and a side of saturated fat while Tilly watches Peppa Pig. Because nothing says “you’re a very naughty girl” like being plonked in front of your favorite show with a snack and a blanket. Haha. Love your friends perspective. With 4 kids she has gotten really good at seeing the positive in situations. She’s a really amazing mum – don’t know how she does it!